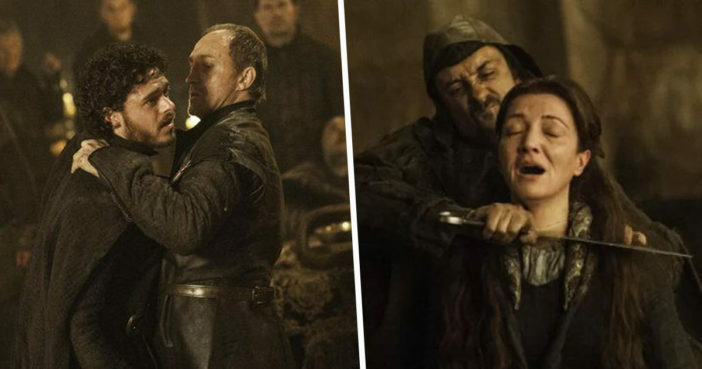 The Red Wedding arguably delivered the most shocking scene of Game of Thrones so far, perhaps because the realisation dawned on us at the same time as the doomed characters. Of course, we knew Walder Frey wouldn’t accept the snub against his family from Robb Stark. But despite our creeping unease, the gruesome revenge was shocking in its extremity. Who could forget the dread on Stark matriarch Catelyn’s face as the wedding band began to play The Rains of Castamere, that sinister ballad of Lannister remorselessness? Or when she noticed the telling chain-mail beneath Roose Bolton’s garments? And yet, until blood began to pour from opened throats, we were sure Robb, Talisa and Catelyn – and of Grey Wind – would emerge from the betrayal with a few flesh wounds, ready to fight another day. The show had hardened us against brutality, but this felt crueler somehow. Taking place during the penultimate episode of season three, this was also one of the biggest turning points in the series, with hopes for a speedy restoration of House Stark – quite literally – cut to pieces. Moments before the Frey banquet hall was washed with blood, we were on the edge of our sofas watching Arya edging ever closer to her brother and mother. We were shedding a bittersweet tear at the prospect of Talisa naming her unborn child after the unjustly executed Ned Stark. The episode name – The Rains of Castamere – should have given us a grim hint of how the episode would culminate, with the chilling lyrics cautioning of a rebel family wiped out by the ruthless Tywin Lannister. But the slaughter was still shocking, and some fans still feel distraught years later. According to a recent article by Entertainment Weekly, author George R.R. Martin still receives hate mail from those who read the scene in his novel, A Storm of Swords, despite the book having been published in 2000. When the book came out I got a lot of emails, and I still get them, saying, ‘I hate you, how could you do that, I’m never going to read your work again’. Others say, ‘I threw the book across the room and a week later I picked it up again and it was the greatest thing I ever read.’ What can you say to someone who says they’ll never read your book again? People read books for different reasons. I respect that. Some read for comfort. And some of my former readers have said their life is hard, their mother is sick, their dog died, and they read fiction to escape. They don’t want to get hit in the mouth with something horrible. And you read that certain kind of fiction where the guy will always get the girl and the good guys win and it reaffirms to you that life is fair. We all want that at times. There’s a certain vicarious release to that. So I’m not dismissive of people who want that. But that’s not the kind of fiction I write, in most cases. It’s certainly not what Ice and Fire is. It tries to be more realistic about what life is. It has joy, but it also had pain and fear. I think the best fiction captures life in all its light and darkness. The final season of Game of Thrones will arrive April 14 on HBO in the US and Sky Atlantic in the UK.